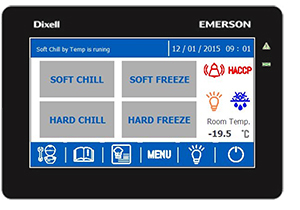 XB8870D is the innovative controller for the optimized management of blast chillers. Designed to better manage blast chilling, freezing and food storing, it is characterized by its configurability and easiness of use of the chilling cycles. The highly customizable user interface and the high performances are just some of the features that allow the controller to fully satisfy even the most demanding customers. 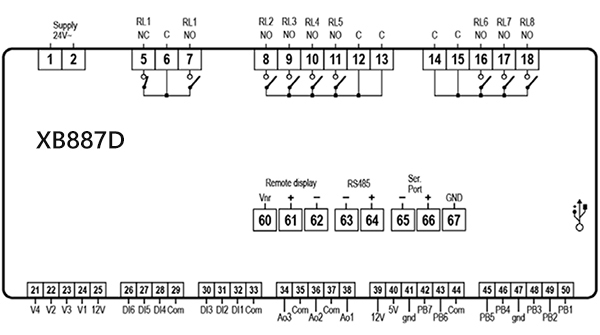 The strong points of this device are the relays with higher capacity suited to directly drive the loads and the connections with screw disconnectable connectors. 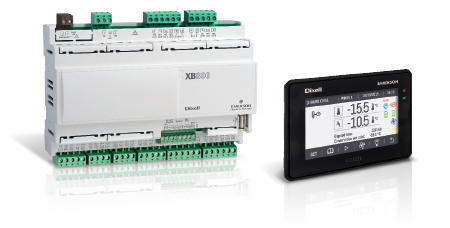 The controller is available in 10 DIN Rail size, and, thanks to Visotouch graphic display, it allows the user to instantly obtain complete information on the status of the machine (room temperature, product temperature, remaining cycle time, etc.). • Chill : when it is necessary to reduce the temperature with immediate impact, below 10°C (from 35°C to 65°C is the critical temperature zone for the higher bacterial proliferation). • Freeze : normally preceded by a CHILL cycle, it is used to freeze food in a faster way in order to preserve its organoleptic properties and to avoid icing inside of it. SOFT CHILL cycles : the blast chiller works with a room temperature that usually is positive. HARD CHILL cycles : the blast chiller works with different room temperatures; usually the first one is negative while the second one is positive. HARD FREEZE cycle : the chiller works at a room temperature that is usually around -35 °C. Dixell expands its range of products dedicated to blast chillers by introducing a new application designed to manage blast chilling, freezing and food preservation.